Option #1. Do nothing...let the future take care of itself. This choice is arguably the most irresponsible position one could possibly take. For example, if you throw money from any crowded street corner, you will witness a lot of pushing, grabbing and shoving. The higher the currency’s denomination, the worse the chaos becomes. Think what would happen if you tossed the maximum possible denomination—which is the Free Crown. There would be absolute unconstrained bedlam. So shall it be as we draw nearer to the FCP. To think otherwise would be the height of naïveté. If wiser heads prevail, this option (presently in place) will be abandoned in favour of something better—hopefully, before the grand commotion begins. Option #2. Relinquishment...let’s all hand in our gadgets, so we can postpone the FCP problem indefinitely. Realistically, no government will ever institute the extreme policy of relinquishment without establishing sufficient cause. Therefore, it could not be implemented and sustained without full public disclosure and a broad, unwavering consensus. The FCP is achievable through many technologies—all of which would have to be surrendered voluntarily or expropriated by force. As such, a growing black list would be required banning certain equipment, machinery, tools, knowledge, etc. To ensure that such a ban is universally observed, every neighbour would be given tacit approval to spy and inform on fellow neighbours. After all, everyone’s freedom and civil liberties are at stake. One mistake here could plunge this civilization into a new dark age, under an endless parade of whimsical dictators, each one more paranoid and narcissistic than the preceding one. Foment their imaginative and ingenious negative creativity. Look for an opportunity to grab the approaching Free Crown, using a non-banned tool, technique and/or technology. Stonewall all outsiders by feigning ignorance and blurring the obvious. As such, the future governing authorities will need to expand the black list to a draconian level, if they want to ensure success, along with a healthy safety margin for contingencies. Among other things, the list would include lasers, microscopes, fermentation tanks, robotics, mineshafts, computers and eventually electricity. Consequently, this option ultimately creates a stagnant, dreary, “have not” world of secrets, treachery and thought police (Big Brother). So, in time it might be forsaken for something better. Option #3. 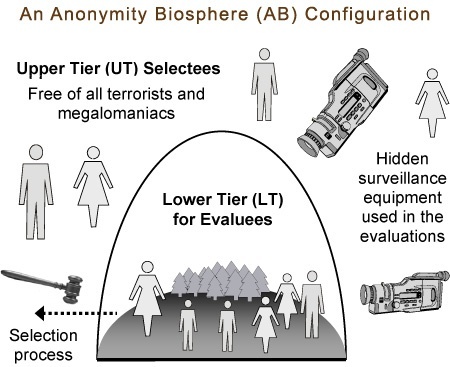 Anonymity Biosphere (AB)...or the covert relinquishment approach. AB’s are terrestrial or space-based habitat structures that are designed to foster deep ethics testing and propensity assessments on all their inhabitants or evaluees—under the guise of anonymity. They are configured into two environments. The external area is the Upper Tier (UT) and this is where all the AB administrators and their support staff conduct operations. The inside portion is suitably named the Lower Tier (LT) or Evaluation Tier. It is the test bed for the whole enterprise. Create an artificially low-tech environment inside, where all the evaluees can be kept ignorant about their true wider reality. To accomplish this feat, the first inhabitants would be of a young age. Instruct them on the appropriate ethical and moral behavior, during a few succinct “visitations” at the beginning of each AB cycle. Give them every indication to believe they each have self-determination and may exercise personal responsibility. Sporadically bestow on them various rewards and punishments, based on their individual and collective choices and actions. Give them every opportunity to believe erroneously, that they have “boundless” anonymity should they decide to secretively plot and conspire against the interests of their fellow residents. The megalomaniacs will have no incentive not to show their true colors. Shower them all with a wide variety of temptations. This will, in effect, give them enough virtual rope to hang themselves, depending on the individual choices they freely decide to make. Install a large plethora of hidden high-tech cameras around the AB structure to record everything that transpires inside. Set up additional resources to maximize testing. After a long and prudent assessment period, set up a “Judgment Proceeding” to choose the new batch of selectees worthy of the UT. Those selected can live out the rest of their years liberated from the cameras and the fear of world tyranny and despotism. Everyone growing up in this artificially fabricated reality will be unable to smoke out the truth, that he or she is being watched and graded. This blind spot is the only universal flaw that all megalomaniacs have, so we have to milk it for all it is worth. 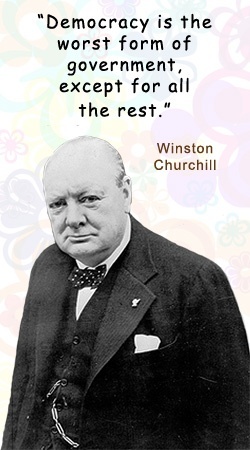 Too susceptible to mischief by outside detractors. However, no effort on our part may be required. Why? Because if our species is going to build AB’s on ourselves in the future in order to tame the FCP, then maybe we have already done it to ourselves! There is evidence of this. 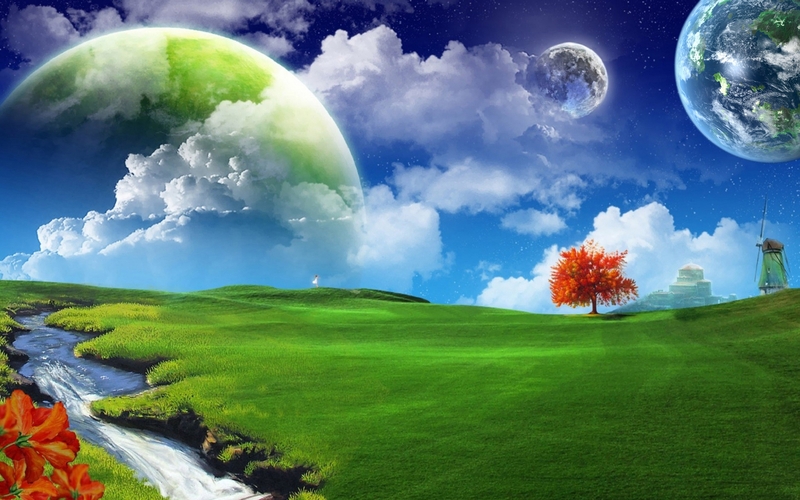 Yes, soft evidence that a highly advanced transcendent intelligence(s) set up this planet as their AB. If such were the case, it would save us all a lot of time and trouble. Bottom line, it is easy for some to visualize a move from option #2 to option #3. The rationale being, since we have to raise our children in a have not world anyway, we would prefer to do so inside an AB. That way they would be happier, not knowing what they’re missing out on and if some turn out to be selectees, they can be ushered into the lavish, unrestricted UT. There they can be free from the cameras, relative poverty and any threat from terrorism and dictatorships. As a result, this option is better than option #2. Option #4. If you know of a viable fourth option, please e-mail it to me for publication. After all, we are all in this boat together. Granted, all these choices are very sobering, but these are the cards before us and we have to make the best of it. The universe doesn’t owe us anything, including simple philosophical solutions. 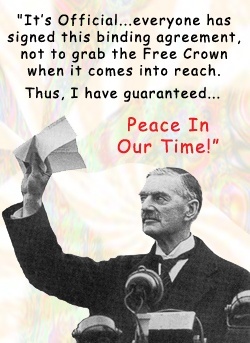 The “Neville Chamberlain approach” is hopelessly and recklessly naïve. Once a deceitful megalomaniac obtains the Free Crown, he or she can recant, ignore the public indignation and revise the history books—expunging any reference to these feeble and silly contracts. 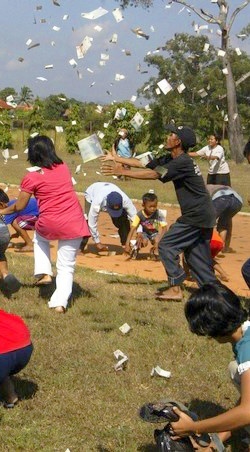 An Indonesian businessman sparked a scramble for cash when he dropped $10,600 (100 million rupiah) from an aircraft to promote a book. A 13-year-old girl lost consciousness in the ensuing mayhem and had to be rushed to a nearby hospital, the Detikcom news service said. Serang City, June 1, 2008. Perhaps the Anonymity Biosphere solution is the worst, except for all the rest. Anonymity Biospheres (AB) offer the best ‘signal to noise’ ratio of any recruitment tool, for a space colony wishing to remain free.